Ben Mark Holzberg/CBS ©2017 CBS Broadcasting Inc.
CBS’ low-rated summer drama series has been saved. 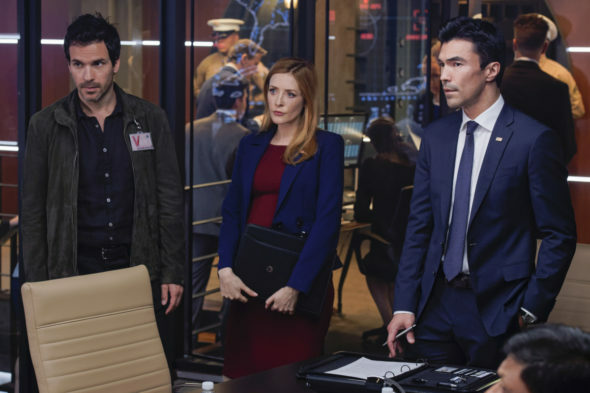 The network has renewed their Salvation TV show for a second season. The program will debut during the summer of 2018 and will return with 13 episodes. STUDIO CITY, Calif. – Oct. 18, 2017 – CBS today announced the second season renewal of the suspense thriller SALVATION for broadcast during summer 2018. Season two of the serialized drama received a 13-episode order. SALVATION centers on Liam Cole, an MIT grad student, and Darius Tanz, a tech superstar, who bring Pentagon official Grace Barrows a staggering discovery – that an asteroid is just months away from colliding with Earth. Now with the added threat of nuclear war on the horizon, they work together with Secretary of Defense Harris Edwards to find a way to divert the asteroid, stop the war and save humanity before time runs out. The fate of CBS’ other summer drama, Zoo, is still up in the air. What do you think? Did you watch the Salvation TV show? Are you glad that CBS renewed it for a second season or, do you think that it should have been cancelled instead? 5/24/18 update: Season Two of Salvation debuts June 25, 2018. Details here. I hope that the series will be renewed for a THIRD Season! I just finished watching the first two on Amazon after my father told me about the series. I think it is one of the most well done that I have seen in recent years, regardless of any science issues that may or may not be 100% accurate. I love SALVATION so much that I purchased the use of CBS on my laptop so I was able to binge watch both seasons….and I am so glad I did. I waa really upset when the last episode was over. You have got to bring it back with season 3…..if not more. Very glad. Didn’t know it was back on. Wish there was more advertisement letting everyone know. They finally listened to the fans! Glad to see Salvation is coming back for another season. good show! Glad they renewed it!! It was a great show! Glad they renewed it! Very glad . It’s a great show. Love this show! I’m happy they saved it. I loved this series and hope it is returning.